Fall is the time to find everything PUMPKIN! Every year more and more pumpkin flavored foods come out in all sorts of places–restaurants, coffee houses, donut shops, supermarkets… Not just good old pumpkin pie. There is pumpkin flavored coffee, tea, scones, muffins, pancakes, cookies, ice cream, cheesecake and even soup, pasta and pasta sauce. Unfortunately, most of these pumpkin flavored foods are not very healthy. Most have a lot of fat and sugar to say the least. Many are full of artificial flavors and other ingredients. If you love pumpkin, there are a lot of “treats” to try. Most of these delicious foods are only available for a short time each year. Popular items even sell out fast. When I first tried a particular pumpkin flavored coffee a few years ago, I loved it. When I finished the package I went back to the store to get more; it was sold out! I had to wait an entire year to get it again. The next year I stocked up. When thinking of pumpkin flavored foods, protein bars and nutrition bars are not usually what come to mind. But why not? If you are looking for a natural bar with no dairy, gluten or soy and no added sugar and you love pumpkin, RX BAR PUMPKIN SPICE is definitely worth a try! These Pumpkin RX BARS taste like pumpkin bread or a pumpkin muffin. They have just the right amount of spice without being overpowering. They taste like you are eating a delicious treat, but because of the healthy ingredients, you can enjoy this “treat” anytime. RX Bars are a good choice if you are looking for a bar with a good balance of protein, sugar and fat and no chemicals or other artificial ingredients. 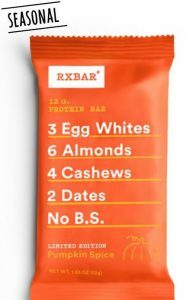 Pumpkin RX BARS have only 8 ingredients: Dates, Egg Whites, Almonds, Cashews, Cinnamon, Natural Flavor, Pumpkin and Cloves. In summary, I find these Limited Edition Pumpkin Spice RX Bars a delicious and healthy way to enjoy the taste of pumpkin in a natural and healthy way. With a good balance of protein, fat and no added sugar, you can enjoy this pumpkin “treat” anytime. Great review, definitely gives you every thing you need to know! The ingredients list on the RX bars looks awesome being that its all natural products and doesn’t contain any preservatives or processed crap. I know your website is protein for women but I might have to find some of these and give them a try myself! My website is geared toward women, but the RX BARS and much of the info is not just for women. Click on the link in my RX Bars Reviews or this review to buy some! I like that you look at sat fat but in general this protein bar sounds pretty good. Thanks for stopping by and leaving a comment, Dorothy! Stop by Protein 4 Women often. Reading about that just made me want to eat them right now. Yes, the Pumpkin RX BARS are yummy! The good news is you can eat them right now and not feel guilty! I was so excited about these until I read that they are a bit high in sugar. I’m trying to cut back on my sugar intake, so I’ll probably skip this treat, but it does look like fun for someone trying to increase their protein intake! Yes, unfortunately the RX BARS are a bit high in sugar. However, compared to many bars out there, they are one of the healthier ones. Yes these bars have 8 grams of fat but they are not from added oils. I tend to think that the naturally occurring oils are not as bad for you as when they are packaged in a factory. I may be nuts ( no pun intended) but, I tend to find that foods with ingredients like these will give me more energy over a longer period of time. It takes a while before I get hungry again. I shall have to get some. Natural fat from nuts is much better and healthier than other types of fats–especially those highly processed. That’s one of the things I like about RX BARS–natural ingredients! This is a really interesting brand of bar, I’ve only had the dark chocolate sea salt one but like the rest of our culture, I have a fascination with pumpkin spice anything. I didn’t actually know they made this flavor so I’ll have to give it a shot with your tips in mind, thanks! 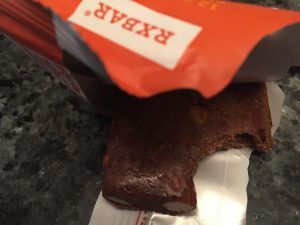 What did you think of the dark chocolate sea salt RX BAR? I’d love to hear your thoughts on the Pumpkin RX BARS. I like the fact that they take a while to chew! I find myself buying yummy bars, and then inhaling them :/ These sound great and I love pumpkin! The peanut butter/chocolate ones look good too. I did not see in the cons that they taste grainy. That is the only thing I don’t like in a bar. I clicked on they buy link, and shoot they are really not too bad for price. I will definitely have to give them a try! Thanks for visiting. I’m happy you have decided to give the RX BARS a try! There are many flavors to choose from besides the Pumpkin RX BARS. Rest assured they are not grainy. The dates give them a chewy texture. I’d love to hear what you think of the RX BARS after you have tried them!